This C4 Stand Up Paddle Carbon 12K Heavy-Duty 1 piece stand-up paddle is ultra-durable, beautiful, and weighs a mere 24 oz. 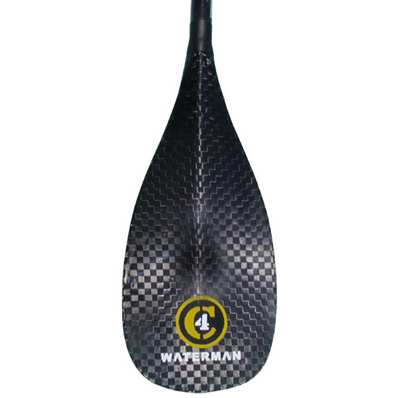 The stand up paddle has a solid 12K "checkerboard" weave carbon blade and a large oval carbon shaft for smooth power transfer . Using carbon for both the shaft and the 8" carbon blade produces great flex and power, and also guarantees good balance for stand up paddle surfing. The smaller blade makes it easier to control than larger width blades, and features C4's sup paddle patent pending dihedral keel power face for productive, fluid strokes. The c4 sup paddle also features a 12K carbon palm grip and has a C4 logo on the front and a Pohakuman logo on the powerface. It comes with a grip color option, is and the stand up paddle is adjustable to all lengths below 87 inches, and has an accessory option. The manufacturer gives a one year limited warranty. 8" patent pending keel-faced 100% 12k carbon blade.